Haven't seen any specific suggestions re UI changes, so thought I'd kick things off with some thoughts re the galaxy map. 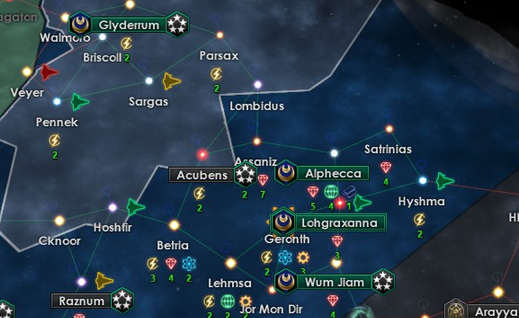 One thing I love about AI War is how it makes taking a planet a true strategic decision. It's not just 'expand everywhere' - the player actually needs to evaluate cost/benefit when deciding where to go next. Unfortunately, the current galaxy map does not make this delicious decision-making process easy. Currently mousing over a target planet presents a high level overview of the planet's 'contents' (assuming you have scouting). 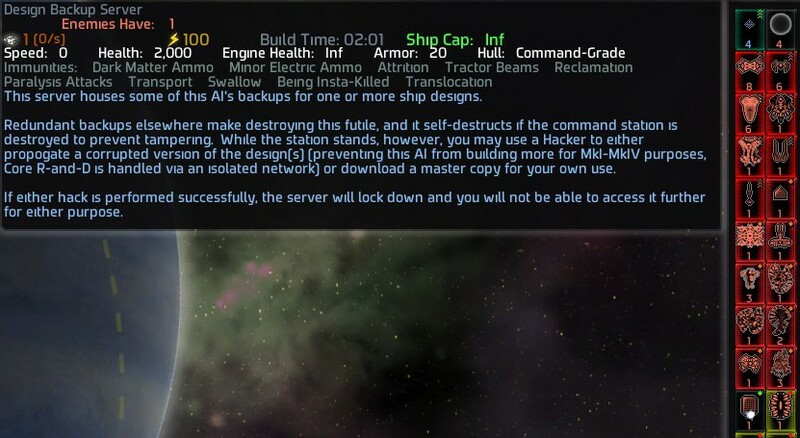 The problem is that I often want to know what each of those ships/structures does eg what does a 'Backup' do? (c) scroll around the entire planet area dutifully hovering over every unit in the hope I find the right one (worst case, when you have no units on a previously scouted planet). Why can't I just do this from the galaxy map? Which brings me to my main suggestion. Rather than have a left-click take the user to the planet screen, instead have it pop-up some sort of contextual planetary overview (displayed/expanded around the planet itself, rather than in the corner of the screen). 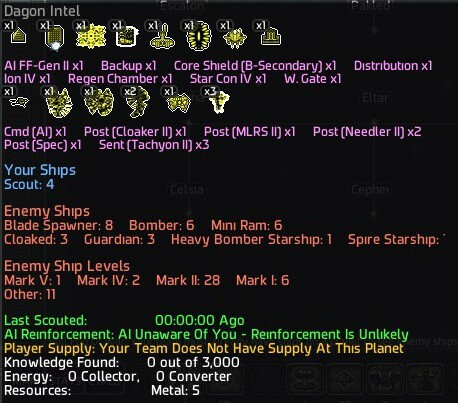 Initially it would give core information (unit counts of different 'types', key structures, etc) but hovering over various elements would display further tooltips (eg hovering over a particular structure like you would on the planet screen). Double left-clicking (or a single click in the centre of the popped up overview) would take the user to the planet screen. The galaxy map should also serve a strategic purpose in identifying where key units are and moving them to where they need to go. If I have an incoming wave to planet 'X' and I need all my fighters to converge on that planet ASAP, it should be a relatively straightforward task to do this from the galaxy map. The broad search option sort of achieves this, though it would be better if hitting the broad search keybind automatically gave keyboard focus to the search field and, as you type and search results were presented, you could quickly tap the up arrow a couple of times to select the desired result. Ideally the planets where the units are located would stand out a bit more ie big icons with a count number in them. The actual selection and movement of the located units is the tricky part. I don't believe there's any option currently other than going to the planet screen, selecting the units, then ordering them via the galaxy map...for every planet which has those units present. It may be technically challenging, but simply clicking on the aforementioned icons on the galaxy map (and perhaps being prompted for 'just this planet' or 'all planets this ship type is on' and right clicking the destination planet would be...well...it'd be fantastic! Could these be customisable? As much as I've read recommendations on how to use these (eg P9 for ARS, P1 for Danger!, etc), I think allowing a two or three letter custom tag would be far more intuitive and flexible. I don't recall right-clicking one of these buttons doing anything - perhaps that could pop out an edit window where such things could be customised? Custom galaxy layouts were an awesome addition. Is it possible to set the game to auto-load them when loading a saved game? A bit of a jumble of ideas, but just throwing them out there for consideration. Be keen to hear everyone else's thoughts! I have been meaning to mention that you have a ton of really good thoughts in here. Overall the galaxy map is just going to be ripped to shreds and rebuilt in terms of the GUI, but a lot of what needs to happen is partly based on the underlying mechanics, which I've been trying to alter in ways that will be conductive to a good interface rather than requiring quite so much information overload. This is definitely a very detailed discussion to have, and will be a big part of what I am working on during alpha and after, even. 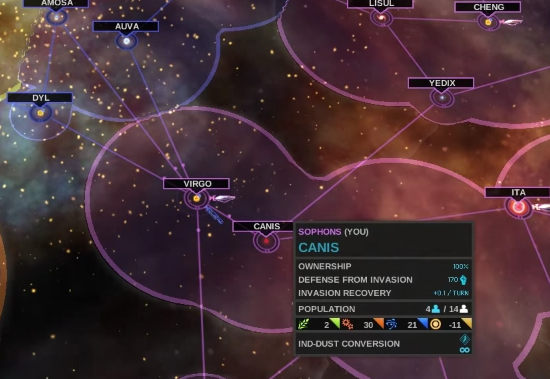 On a similar note, what if whenever you played on an AI of 5 or under, there would be a little "help" thing when you moused over a planet that said something like "The ARS on this planet would make it a good target" or "This is a very heavily fortified system. Make sure you have a big fleet when you attack." The goal of this would be to have some extra built in help for a newer player on an easier difficulty. I would say make that optional, I can see experts wanting to do a nice easy game every once in a while. Option that's on by default, maybe? Could definitely be something to consider, but it depends how in-depth the tutorial ends up getting, I suppose. Could also help if you're trying to play with friends who are new to the game so they have some ideea of what's going on in a campaign game. I had a thought on this. What if the "important" buildings on a planet were placed in orbit of the planets on the galaxy map? For new players it would be pretty natural to mouse over them to find out what they are. More experienced players could recognise them and therefore get much of the important information about planets at a glance. This might even completely remove the need to put priority markers on planets in the way I do in AIWC. That is a freaking fantastic idea. Holy cow do I love that. That's useful for everyone, like you say, and I'd love to get away from having to do stupid markers by hand like in the first game. We can 100% do that from a technical standpoint, and it's super easy. I suppose the question will be if the graphics are able to show large enough to be useful, but at worst I imagine we can use their icons rather than their real graphics -- or some sort of hybrid. That really just is a matter of the details of art presentation, though, which is just something to experiment with and then see. This is one of those "why didn't I think of that" things that really makes me love this community. Great thought! Glad to help, and it's great you listen to the community like you do.